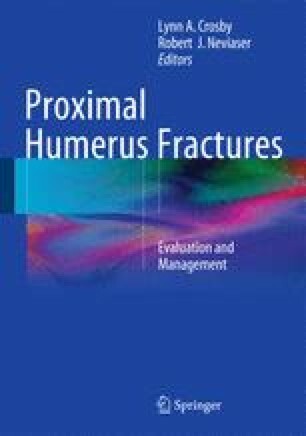 The majority of proximal humerus fractures are amenable to nonoperative treatment. Most patients are elderly sustain low energy injuries. Nearly all of these patients will have an acceptable result with nonoperative management. A thorough history and physical examination should be performed with each patient to evaluate for concomitant extremity fractures as well as neurovascular injury. Standard sling immobilization with early and progressive mobilization will provide the most acceptable clinical outcome. Rarely complications such as stiffness, osteonecrosis, malunion, and nonunion can occur with nonoperative management of proximal humerus fractures. Very few high level outcome studies exist examining surgical and nonsurgical management of proximal humerus fractures, but nonoperative treatment of the majority of these fractures can provide acceptable pain relief, patient satisfaction, and function in most individuals.